Back Row: John Morton, David Clowe, Tom Hunter, Gordon Fulton, Douglas Morrison, Peter Auld, Robert Ferguson. Second Row: Samuel McVie, James Benson, David Dalziell, Alec Morrison, Alistair Kelly, David Dunlop, Billy Chalmers, Nicholas Wilson. Third Row: Barbara Mathieson, Anne Blair, Anne McCrindle, Aileen Gordon, Allana McDougall, Margaret Yuille, Mary Smith, Catherine Morrison. 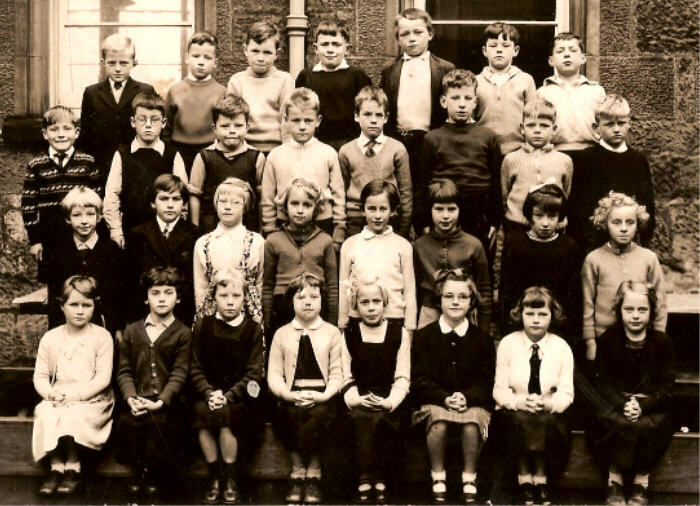 Fourth Row: Eleanor Milligan, Molly McArthur, Margaret Conn, Christine Anderson, Jean Dowie, Joyce Loosemore, Margaret McCallum, Jean Blackie or Blackmore.